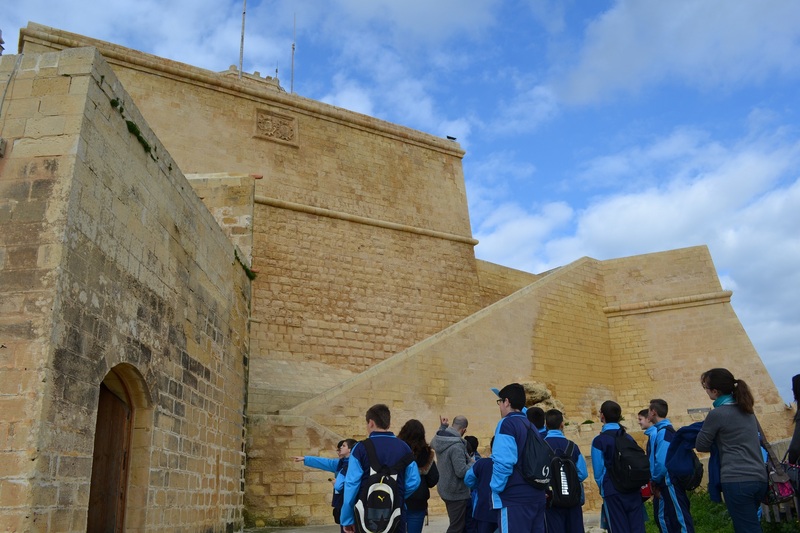 Students from the Gozo Secondary School observing the Citadella’s architecture. Students from the Gozo Secondary School and St Albert the Great College Valletta observe their surroundings to discuss the concept of architecture as part of the KantaKantun project. Following their adventure, the students also had a music workshop with musician and composer Alex Vella Gregory. The Valletta 2018 project KantaKantun is about observing. It is a project which gives students the possibilities of creating new exciting ideas by observing all that is around them. 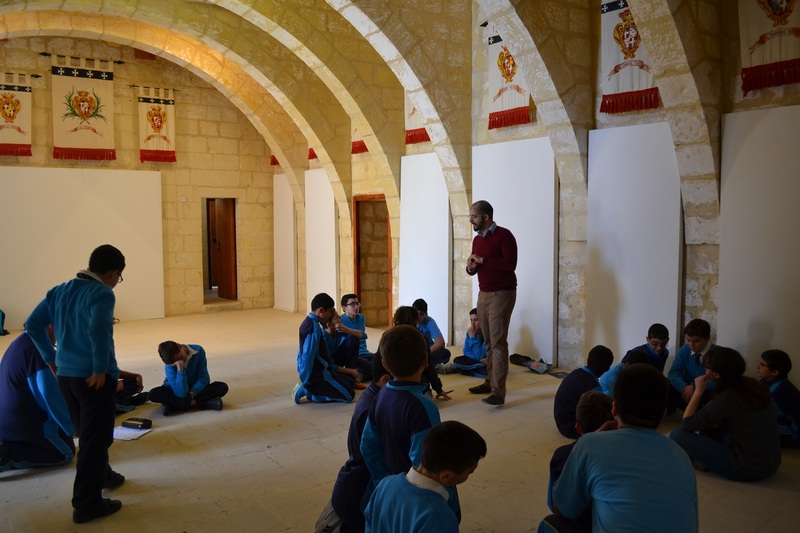 The second part of the project, which is being held with Gozo Secondary School and St Albert the Great College Valletta, focused on how architectural space can help inspire us to create a musical work. The first step was to take a trip around the locality of each respective school. The tours were led by Charlo Briguglio, who is taking care of the architectural part of the project, with the help of the rest of the team. It was here that the students could apply all that was discussed in the first part of the project. The greatest part of this outdoor workshop (apart from the fact that they enjoyed a day out!) was the way they started looking at their environment. Buildings were no longer classified as ‘old/historical’ and ‘new/irrelevant’ but each became an individual space. Gardens, squares, fortifications, landscape features…all of these became part of their concept of architecture. The students discussed materials, shapes, and purpose. Most importantly, they sketched their ideas on a specially designed booklet which not only had a map and itinerary but also space for them to add their own ideas. Despite the exercises being conducted in two important urban areas, each group had a different experience. In Gozo, the students could contrast the modernity of their newly-built energy efficient school with the medieval landscape of the buildings on Bernardo de Opuo Street in the Citadel. They could observe the medieval town plan of Rabat with its wealth of vernacular architecture, as well as the harmonious balancing of styles in St Augustine Square. The Gozo group was lucky that this workshop coincided with the landscaping works at the Tokk and restoration interventions at the Citadel. They could observe the recent excavations and thus get a clearer idea of how the town evolved over the centuries. They were also lucky enough to be granted access to the Grain Silos at the Citadel (courtesy of the Ministry for Gozo and Wirt Għawdex) which apart from being a unique architectural space also has wonderful acoustic properties. The Valletta tour was of a completely different nature. The cosmopolitan atmosphere of Valletta was dominated by grand architecture, most of which is familiar to most people. This is why the tour took a slightly more unusual route, and touched some of the lesser known parts of Valletta. These included the Mandraġġ, l-Arċipierku, il-Kamrata, and Hastings. All of these residential areas were full of surprises even for those students who resided in Valletta. It was great to see the students discuss and question several architectural projects that we perhaps take for granted. These included the Carmelite Church (with its skyline defining dome) and the Old Market which is often neglected. Another controversial project which had their opinions divided was Renzo Piano’s City Gate and Parliament project. The best thing about this debate was how even those who did not like the project could appreciate the design and workmanship. The Valletta tour also had an impromptu visit to the Church of Saint Mary Magdalene which has only just been reopened. The visit was possible thanks to the hospitality of Fr Michael Camilleri OP who not only let us have a look inside the church but also offered some of his time to explain a little bit about the history of the church. Students from St. Albert the Great College, Valletta inside the Church of Saint Mary Magdalene. Following the tour, each school then had a music workshop with me as I’m taking care of the musical aspect of this project. In this workshop the students were first invited to reflect on the tour and pinpoint the things that struck them most. A few important ones were selected and they worked in groups to come up with adjectives, ideas and feelings they could associate with each. The workshop then continued with an exploration of sounds using only voice and percussion. Students tried out different ways of making sound, and they were invited to discuss each sound and describe it. With a palette of sounds at their disposal, the students divided once more into groups and started associating these sounds with the selected architectural spots from the tour. The students then created a series of soundscapes which was then joined together and recorded as one whole piece. What is interesting is how remarkably different the two final soundscapes turned out to be. The Gozitan students placed a lot of emphasis on the sound of bells, whereas the wind was an important protagonist in the imagination of the Valletta school. 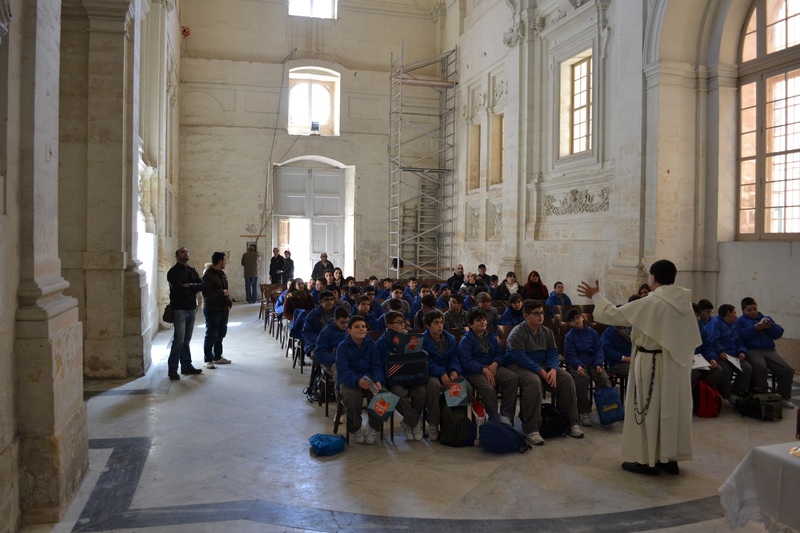 The music workshop for the Gozo students was held at the Sentinella complex at the Citadel (once more courtesy of the Ministry for Gozo and Wirt Għawdex) and the Valletta workshop took place at the Church of Our Lady of Pilar courtesy of Heritage Malta. These recordings will now form the basis for the next part of the project, where the two schools will swap their recordings. They will now listen to each other’s work without knowing exactly what inspired the other students. From this, they will come up with ideas and designs which will eventually turn into an art installation. Workshops with musician and composer Alexander Vella Gregory working with students from the Gozo Secondary School.